MANILA, Philippines — The Philippines’ trade gap narrowed to a three-month low in December, after exports stayed weak while import growth slowed sharply during the month, the country’s statistics agency reported Tuesday. Trade deficit� in December stood at $3.75 billion, slimmer than $3.97 billion gap posted a year ago and $3.90 billion shortfall registered in November. The December print was the lowest since $3.72 billion deficit chalked up in September. For the entire 2018, the country’s trade gap swelled to $41.44 billion, wider by 51.3 percent. Broken down, exports sagged 12.3 percent year-on-year, with electronic products — the country’s top export — falling 15.2 percent in December. Meanwhile, imports slipped for the first time in a year by 9.4 percent after all subsectors showed negative growth. “Consumer imports were once again hit by the one-off effects of the car buying spree in late 2017, but we are mildly concerned about the surprise pullback in capital goods and raw materials,” ING Bank Senior Economist Nicholas Mapa said. “If this continues, this could show that recent aggressive tightening by the [Bangko Sentral ng Pilipinas] is starting to bite into investment appetite, hampering the nascent investment-driven growth story that we have witnessed of late,” he added. Commenting on export’s lackluster performance, Mapa said global trade is likely starting to see the ill effects of the ongoing US-China trade spat. “For the year so far, exports have posted a disappointing -1.8 percent growth rate, indicating that the sector may need more than just a depreciating currency to take off,” he said. 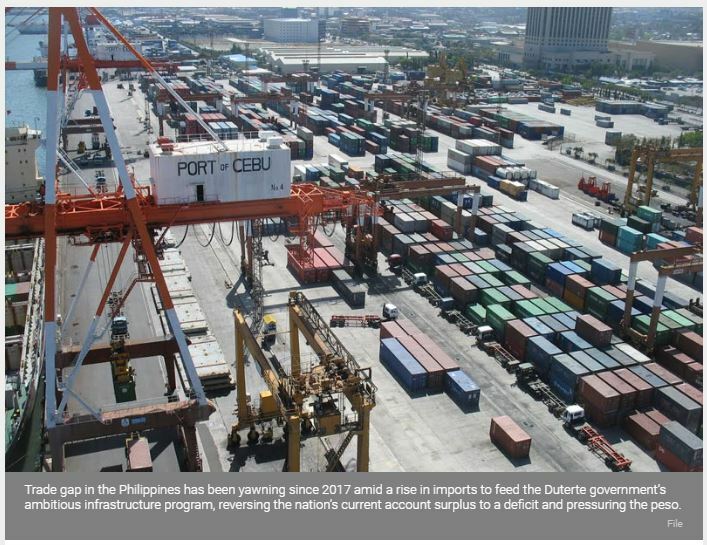 Trade gap� in the Philippines has been yawning since 2017 amid a rise in imports to feed the Duterte government’s ambitious infrastructure program, reversing the nation’s current account surplus to a deficit and� pressuring the peso. The country’s economic managers have repeatedly said high imports would “support domestic economic expansion.” They also said several episodes of peso depreciation would give the export sector a boost. “The recent tightening cycle by the central bank may hinder [investment] growth to some extent while fuel imports will also likely be smaller in 2019, leading us to expect only single-digit growth in the import bill for the year,” he said. “Meanwhile, exports are seen to remain lacklustre given the� dependence on the electronics sector to carry the entire export base, all the more given the external environment and the US-China trade war,” he added. “Despite the continued weakening of the Peso, export performance has not gained the so-called competitive edge that we had hoped it would derive from a weaker currency.� Much more will be needed to get the� export base off the ground,” he continued.